Kogarov sisters are Russian folk singers trained in New York by famous Russian folk singer and Russian traditional vocal teacher Irina Zagornova. Kogarov sisters are part of bigger Russian Folk Kids group from Brooklyn, New York. Videos located below were recorded during performance of Russian folk dance and music ensemble Barynya, Artistic Director Mikhail Smirnov in October 2009. 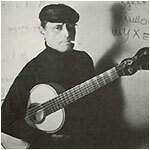 Cast: Kagarov sisters, Mikhail Smirnov (vocals, garmoshka), Alexander Menshikov (vocals), Lev Zabeginsky (balalaika), Leonid Bruk (balalaika contrabass), Roman Ivanoff (percussions), Serge Rogozin (balalaika), Yan Khmel (bayan), Irina Zagornova (vocals), Dancers: Alexey Maltsev, Danila Sherstobitov, Aliaksandr Anatska, Alexander Rudoy, Valentina Kvasova, Olga Chpitalnaia, Ksenya Hentisz, Olga Yeliseyeva.